'Marina di Chioggia' is a very old Italian Heirloom variety that originates near Venice and is considered the King of Italian Squashes. Large unique turban shaped deep blue-green 6 to 10lb fruit are produced on vigorous vines with a rich, sweet, deep yellow-orange flesh of outstanding quality. The rich, sweet flesh is a deep yellow-orange and of good quality. This beauty of a squash squash is medium to large in size and is round, short, and squat in shape. 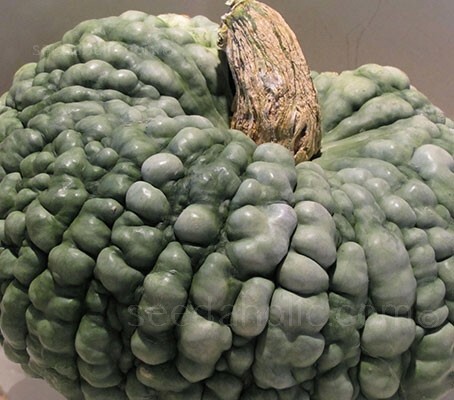 The dark green to grey-blue skin has slight, vertical ridging and is almost completely covered in bumps known as sugar warts, which are created from the build up of extra sugars in the squash’s skin and flesh. The fruits will store for a long time yet the delightful yellow-orange flesh improves in flavour. When mature, the skin will be hardened to the point that it cannot be dented with a fingernail and the stem at the cap will be rough, rigid, and brown. The thick, dense, and dry, yellow-orange flesh surrounds a semi-hollow fibrous cavity with many large, flat, cream-colored seeds. Its meaty and sweet texture has also made this pumpkin popular as a filling for ravioli and for making gnocchi, it is also delicious baked or in pies. Marina di Chioggia have a sweet dry flesh and store well. Store only those fruit that are free of cuts, wounds, and insect or disease damage. Immediately after harvest, the fruit should undergo a ripening or curing process to harden the shell. A curing period of about two weeks at 24 to 30°C (75 to 85°F) with good circulation is desirable. They can then be stored at temperatures of around 10 to 20°C (50 to 70°F). 'Marina di Chioggia' is the heirloom sea pumpkin of Chioggia, a fishing village on the coast of Italy, south of Venice. The large turban- shaped fruits are deep blue-green. It is one of the most beautiful and unique of all squash. A perfect variety for market gardeners. The rich, sweet flesh is a deep yellow-orange and of good quality, delicious baked or in pies. The fruits weigh about 10 lbs each and are produced on vigorous vines. 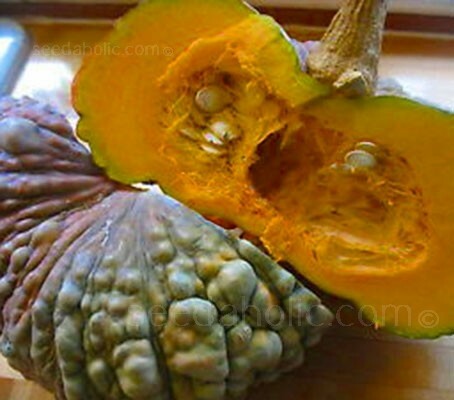 Originally from South America this warty winter squash made its way back to Spain and found its popularity in Italy. This dark orange and sweet fleshed fruit was introduced to Venice in the late 1600s and quickly became a beloved addition to the culinary culture. The network of lagoons south of Venice has been inhabited since the 5th century. Originally the people there fished and hunted small game, harvested sea salt, grew fruit, and eventually vegetables. The region became a major source of vegetables for the Venetians once the salt marshes were drained and cultivated. Winter squash became a key staple for the winter months and especially for the poor who could not afford or access meat as readily. The rich, dense texture of Marina di Chioggia, storing for up to six months, filled this winter food gap and its incredible depth of flavor quickly spread throughout Italy and the world. This beauty of a squash is still served on the canals of Venice. Grilled with olive oil by the bargemen and served as a whole wedge. References to 'pumpkins' date back many centuries. The name pumpkin originated from the Greek word for 'large melon' which is 'pepon', which was nasalized by the French into 'pompon'. The English changed pompon to 'Pumpion'. Shakespeare referred to the 'pumpion' in his Merry Wives of Windsor. American colonists changed 'pumpion' into 'pumpkin'. The 'pumpkin' is referred to in The Legend of Sleepy Hollow, Peter, Peter, Pumpkin Eater and Cinderella.